The microwave is great – prepare food in advance, then just nuke it to reheat on the road. 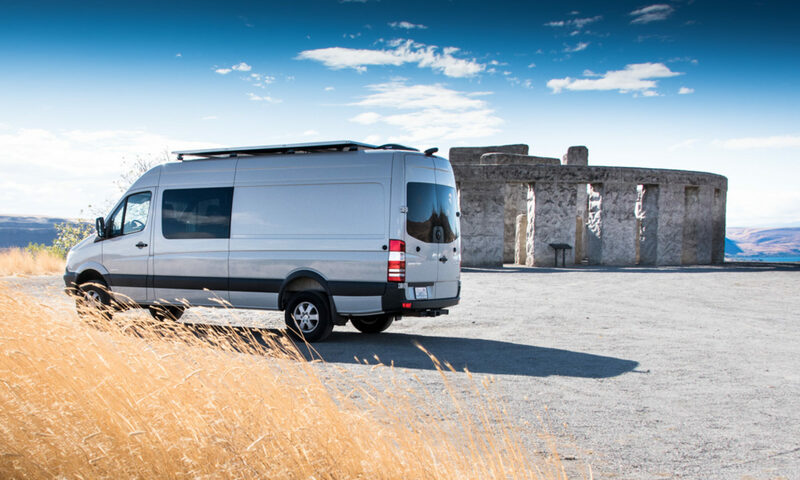 But it needs to be secure in the van. Here’s how we did it. We used a Westinghouse WCM660B 600 Watt Counter Top microwave because it is super-simple, no glowing lights, no computer inside, and so no power draw when it isn’t cooking. It’s also under $60. It’s a 0.6 cubic feet model, and consumes around 1000W of power when it’s running (yeah – 600W is its output, not its consumption). We bolted it in to the cabinet using a small 1/8″ thick aluminum plate mounted under the front of the microwave. 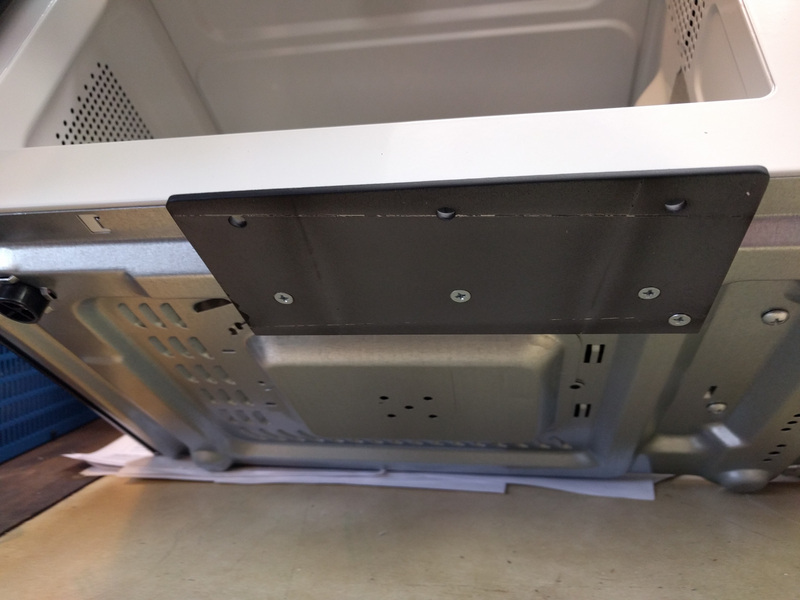 Initially we’d decided to use L-brackets at the back of the cabinet, screwed in to existing holes in the back of the microwave shell. However, we need access to that part of the cabinet to install/remove it (all of our cabinets are removable). We couldn’t bolt the microwave in from behind the cabinet, and then put the cabinet in place against the wall and bolt it to the wall. That meant coming up with a front-mounted solution. Luckily there was a ridge of metal on the underside of the microwave which had nothing behind it. 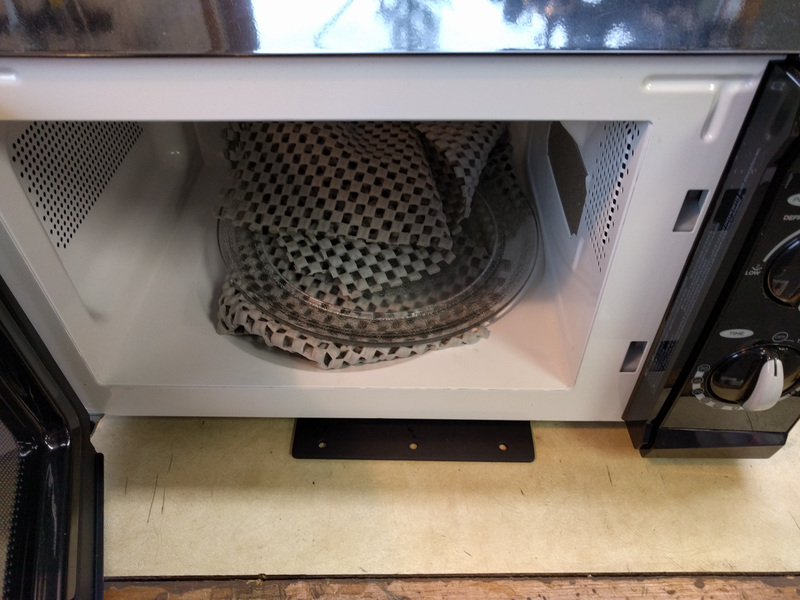 Four sheet metal screws through an aluminum bracket and a 1/8″ spacer mount it securely to the microwave at countertop height. Then, three wood screws mount the bracket to the front edge of the cabinet. The whole bracket is hidden when the microwave door is closed. So far it’s worked really well. We did stick a piece of rubber to the top rear edge of the microwave to stop it from bouncing around in the cubby it’s in. The rubber wedges the microwave in place underneath the top of the cabinet space. The picture shows the glass turntable wrapped in protective rubber anti-slip material, but we’ve found it doesn’t rattle or move around when we’re driving so we don’t use that material any more.